I never had much of an affinity for abstract art until I got a close look at works by Matisse, Picasso and others in a Paris art museum. Now I’m convinced that art doesn’t have to literally “look like something” in order to make a metaphysical connection with the viewer. Edjole’s work is featured on a new website that sells both her prints and her art integrated into mobile phone cases. 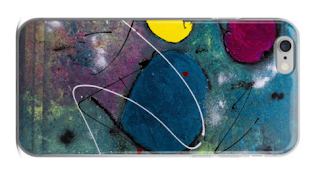 The piece, shown above, is one of many works that are available in mobile phone cases for the iPhone 6, 6S or Plus. Prices for most cases are $32. To browse the catalog or cases and prints, visit the Retrospektart website.